This ADJ lighting package is a great start for your lighting rig, or as an add-on to an existing one. You get the American DJ VPAR Pak and the VEI G300RGB Mini Laser. The ADJ VPar Pak is a compact, low profile LED Par kit with two VPAR LED Pars, a soft case gig bag and an IR wireless remote. The LED Pars feature five 4-Watt, 4-IN1 LED (red, green, blue and amber), a scissor yoke, rubber feet for uplighting and a 4-button DMX display. The VPar is designed for uplighting and stage lighting, and will bring color and excitement to any party. This fixture features a unique "sit-flat" design so that it may sit directly on the ground or inside truss without the scissor yoke because the power & DMX ins and outs are mounted on the side of the fixture, not on the rear. 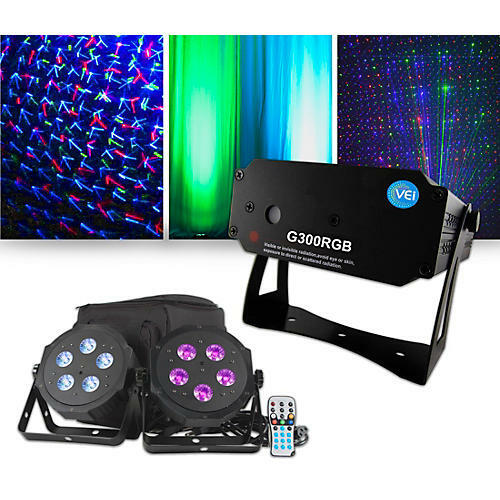 The VPars offer smooth RGBA Color Mixing, have 40-degree beam angles, 15 built-in color macros, 5 operational modes (including DMX, Sound Active and Master/Slave), and have 8 DMX Channel modes for a variety of programming options. Users can also use the included ADJ LED RC2 IR wireless remote to change colors and functions of the LED Pars. The JAM Pack Emerald package combines the evocative power of fog and a UV wash/strobe in one turnkey pack that also offers IRC-6 remote control. The pack's Hurricane 700 fog machine emits thick bursts of water-based fog, which perfectly highlights the combined output of a UV Wash and white strobe. An included IRC-6 remote can be used to control the UV strobe remotely, triggering auto and sound activation modes. Completing this handy party pack are one external power supply and mounting hardware.